There’s no smarter business insurance partner than True & Associates. Our underwriters and industry specialists work closely with your business to provide property and casualty insurance coverage that help you manage your business’s risk exposures, defend against liabilities and protect your long-term interests. With reliable protection and outstanding risk control and claim services, along with dedicated customer service from our agency, you have the freedom to focus on managing your business. We recognize that the least disruptive loss is the one that never occurs. True and Associates is dedicated to helping your practice manage financial costs of preventing losses from occurring. Our Risk Control consultants have a long and successful history of helping businesses protect workers, safeguard assets and improve productivity. We offer a comprehensive package of risk control services that can help your business avoid costly work stoppages. True and Associates’ broad portfolio of products goes beyond the standard business coverage. 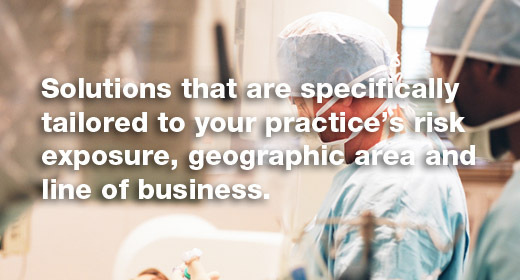 We offer the key coverage you need to protect your Outpatient Healthcare Practice. Business Income — reimburses medical practices for actual loss of earnings up to 12 months for covered loss and extra expense coverage needed to continue business operations during period of restoration. Medical Equipment Breakdown — protects against losses related to medical equipment caused by a covered mechanical or artificially generated electric current. Accounts Receivables — responds to losses caused by the inability to collect outstanding balances as a result of lost or damaged records. Computer and Media Coverage — protects investment in computer technology with reimbursement for physical damage to computer hardware and software including electronic patient records. Built-in coverage for virus damage to equipment, software and data. Spoilage-Perishable Medicines and Medical Supply — Blanket limit available. Legal Expenses for Disposal Waste — reimbursement for legal expenses, within program limit, resulting from violations arising from disposal of medical waste. Workers Compensation Needle Stick Injury Claims Handling — in addition to paying for injured workers initial testing available program offers source patient testing and reimbursement. Automobile Extension Endorsement — provides Employees as Insureds, non-owned coverage, lease gap coverage and loan coverage. Employee Practices — coverage, including legal defense costs, for claims raised in certain employment related lawsuits brought by employees or job applicants.